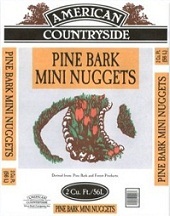 American Countryside Natural Pine Bark Mini Nuggets help control the growth of weeds, retain moisture, and insulate soil to protect roots. This product is easy to spread and is the perfect finishing touch to your landscape. No dyes added.